There’s no getting away from the fact that the sheer romance of watching the sun spreading its glorious colours across the sky and then slipping below a watery horizon appeals to us in some sort of primal manner. 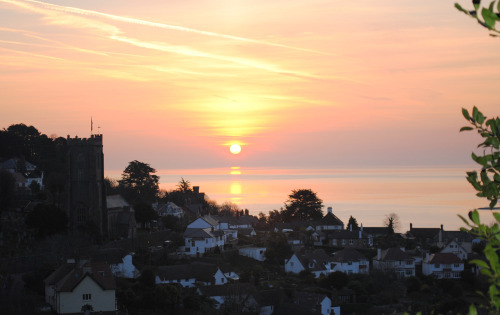 As the sun sets in the west we have quite an advantage, and patient photographers can be spotted all along the Exmoor coast waiting for that that elusive perfect sunset shot. The ever-changing maritime weather patterns offer different palettes, from clear golden skies to angry red slashes through dark menacing clouds, all illuminated like fire on the water. At Dunkery Beacon, Exmoor’s highest point, walkers hope for the former. Having hiked up to watch the sunset over the Bristol Channel they are always tempted to stay on and see the stars.